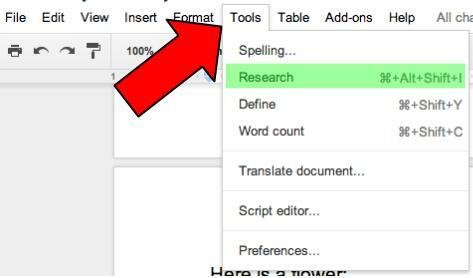 Within a Google Document, go to TOOLS on the menu bar. Choose RESEARCH. A side bar, on the right, will appear. 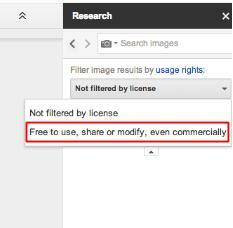 Remember to use ‘Free to use images’. Google allows you to search for these types of images. 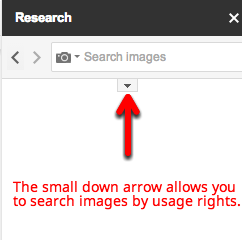 Type an image you are looking for in the Research Search Box. Drag the desired image to the document. Google automatically cites the image for you. 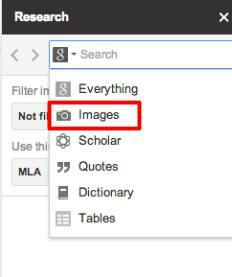 This entry was posted in Classroom, Google, How To and tagged Google, Google Docs, Image, Insert Image by Admin. Bookmark the permalink. Question? When I “break text” the image…. and am able to move the image around on my document the “little number 1” stays where it’s at but the image moves. Can I get the “little number 1” to move with it? Also, if I delete and image, I must remember to delete the source at the bottom but difficult to again to delete the “little number 1”. Advice? A quick work-around, that I have found, is to use the ‘text break’ to move the picture where I want. Then switch the image to ‘Wrap Text’, control-x the ‘little number 1’, then paste ‘the little number 1’ in the desired location. Hope this helps.